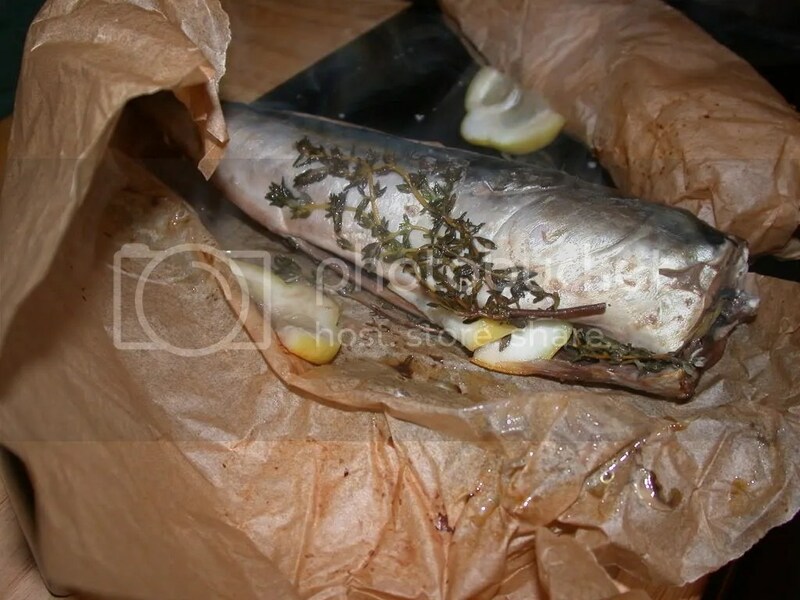 Mackerel is an oily fish and anyone who pays any attention to the myriad of things we’re told we should and shouldn’t eat will know that we’re all supposed to be eating oily fish, of which mackerel is a particularly good example. It most often comes smoked or in a pate but it’s also worth cooking it from fresh. This is a weeknight dinner and takes 30 mins from start to finish. I wasn’t sure what to do with the two mackerel I bought from the farmers market but decided to go with lemon and thyme. You can’t go far wrong with them and fish. As you can see, I simply bunged it all in some baking parchment with some salt and pepper and baked it. 200C for 25 min and it’s done. Ah, fish baked in foil, where we we be on weeknights without you? Mr B did the risotto, so I can’t give instructions on that. Despite a last-minute panic when we realised we’d nearly run out of risotto rice and had to use Uncle Ben’s brown rice instead, it turned out alright. Who knew you could just use ordinary rice in risotto? Clearly, we’ve been fed a line by the risotto rice marketing board. Mackerel is one of my favourite things ever to barbecue (not to Americans – by which I mean grill outdoors over charcoal). I’m on a mad herring and sardines tip at the moment. I had rollmop herrings last week. They’re very moreish. Oh, we Americans call that barbecueing, too, Tansu. Some people call it “grilling”, mostly in places where there’s real Barbecue (Memphis, Texas, the South in general but the Carolinas specifically). But growing up in Nevada, we called it “barbecueing”. Fran, I was once told on a fishing trip to soak the mackeral in milk for a bit to draw out some of the oil. I’ve yet to try that, though. Hmmm. Pants (can I call you that, not being one of the Chi crowd?) – I’ve also heard the milk thing. It also applies to livers, to reduce their potency. But I like strong flavours so it’s not something I would do. Of course you may call me Pants! This is because I like you.